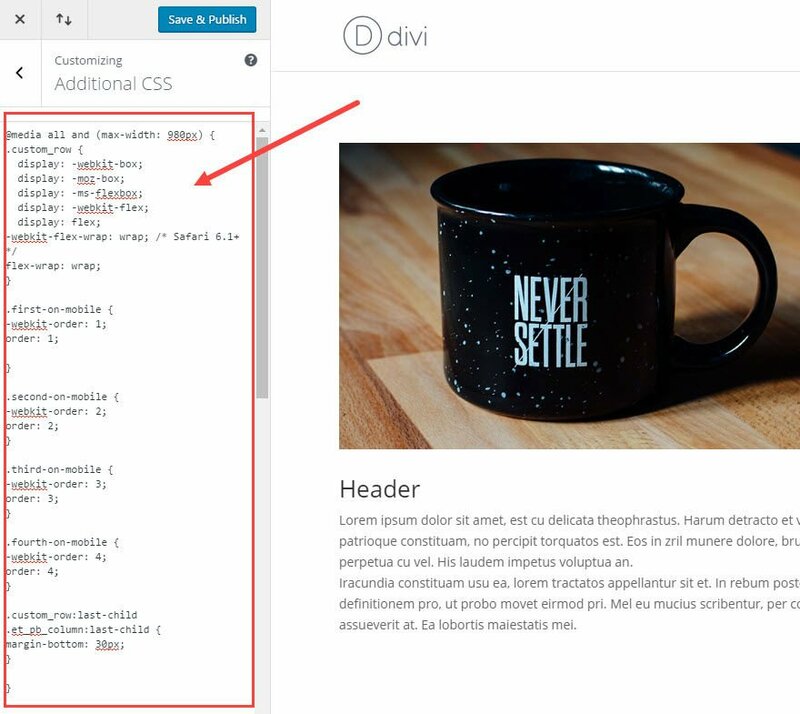 Divi is built on a responsive grid that stacks (or orders) your columns in a certain way when going from desktop to mobile displays. The columns are stacked in order from left to right. So if you have three columns on desktop, the left (first) column will be stacked first on mobile followed by columns 2 and 3 underneath. This makes sense and is usually what is needed for most websites. But sometimes certain designs that look great on desktop create an inconsistent ordering of content on mobile. In this case, you will need to change the order of columns to create a more consistent user experience on mobile. 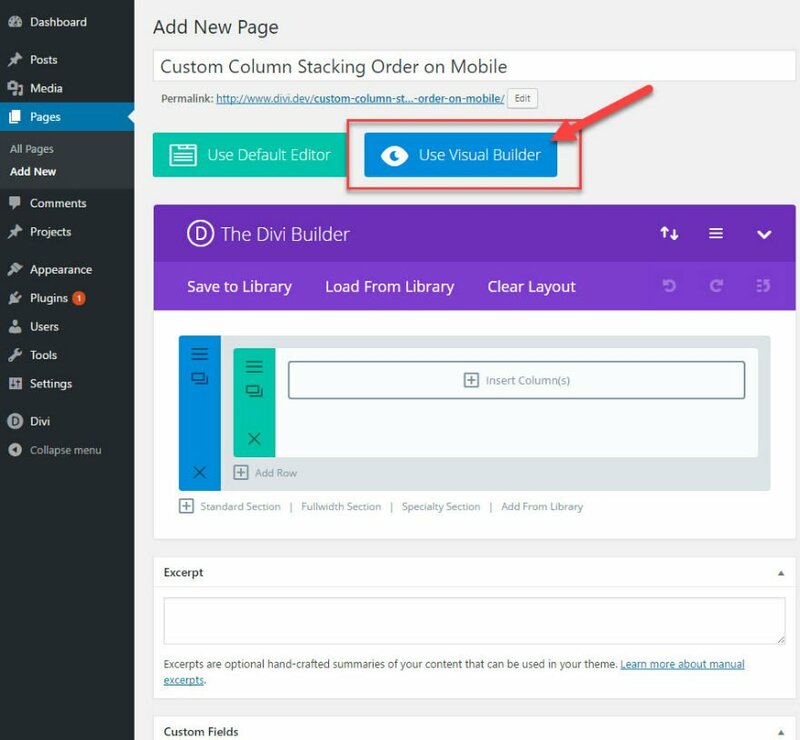 Today I am going to show you two ways you can change Divi’s column stacking order on mobile Devices. The first involves creating an alternate version of the content specifically for mobile devices using the “Disable On” feature within Divi. The second way is to use custom CSS to add classes to your columns which designate their order on Mobile. 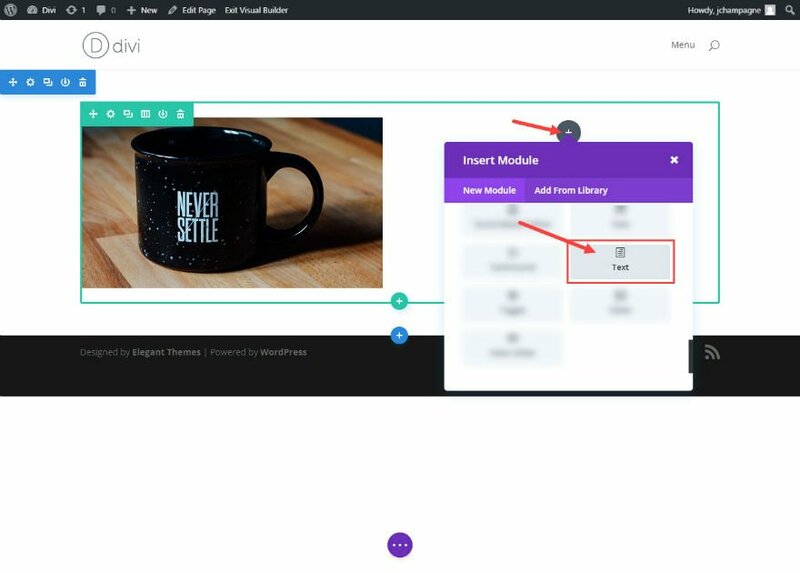 On a new page, click to use the Divi Builder and launch the Visual Builder. 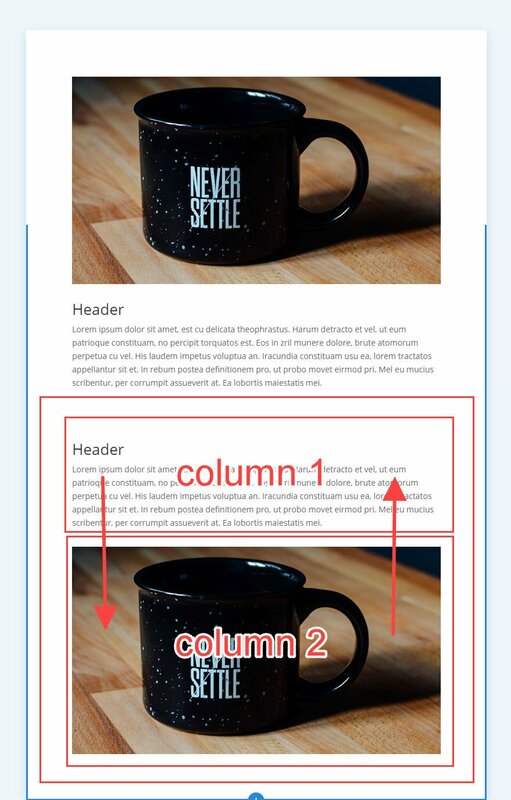 From the visual builder, choose a 2 column (½ – ½) layout. 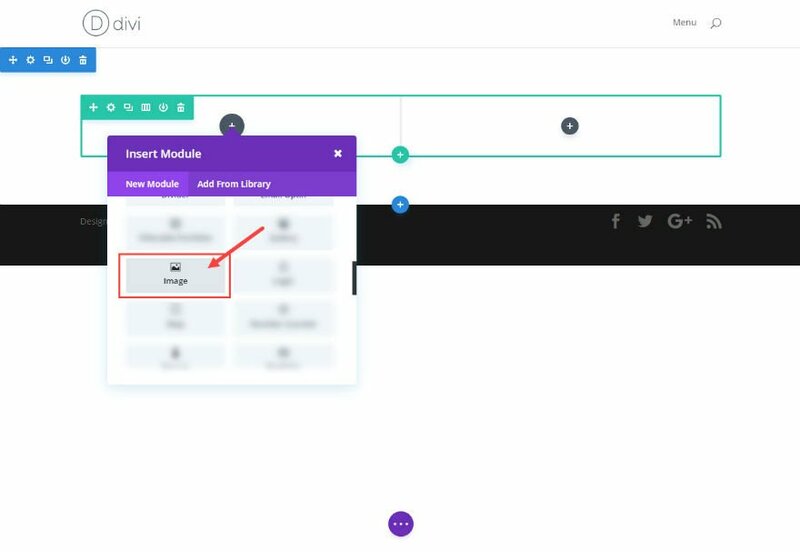 Add an image module to the first column inside your row. Next, insert a text module in the second column of your row. Under the General Text Settings, add your text to the Content text box. 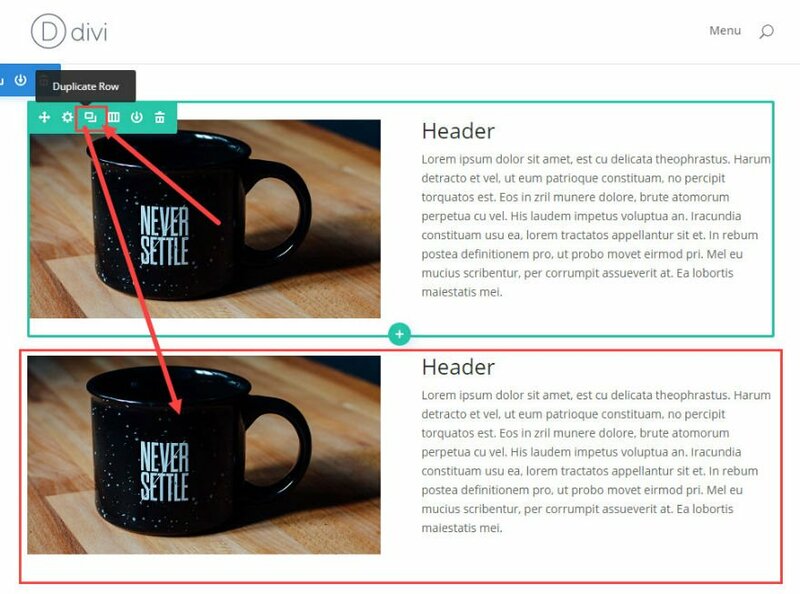 Now you should have one row with 2 columns with the first row containing an image and the second row containing text. I’ve labeled the columns for you in the following image. From the visual builder, duplicate the row with the same 2 columns by clicking the duplicate row icon. 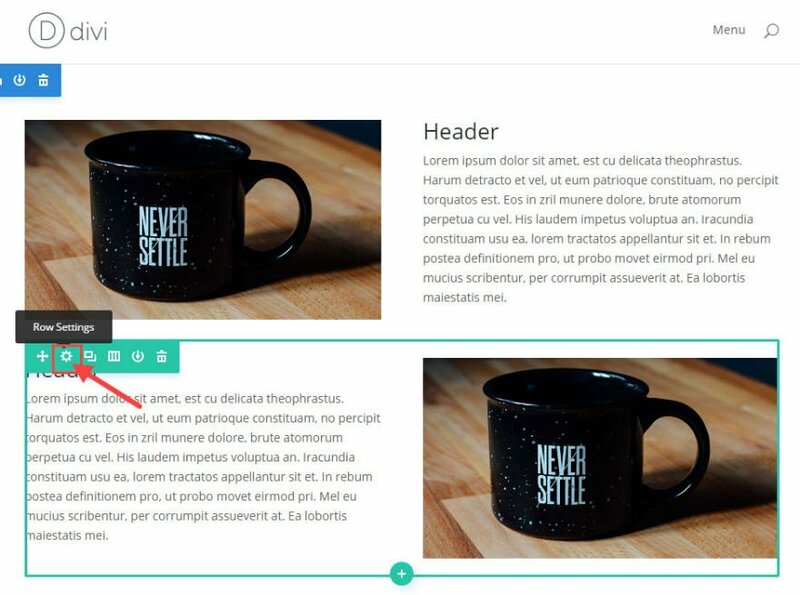 On your second row (the duplicate row you just created), drag the image module over to the second column and drag the text module over to the first column. A better layout for mobile will be to change the stacking order of the columns in one of your rows so that you get a more consistent layout of content. 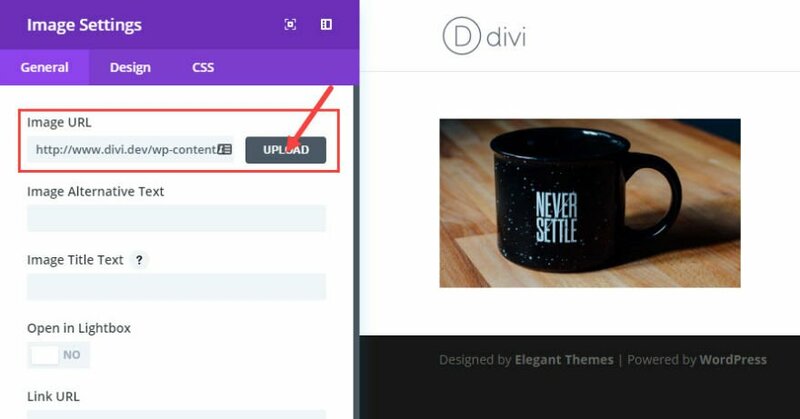 Divi’s “Disable On” feature allows you to create different versions of your content on phone, tablet, and desktop displays. With a few clicks you can hide or show sections of content on any device. For this example, we need to keep the second row visible on desktop but hide it on mobile devices. Then we need to create a different version of the second row to be visible only on mobile. Using the Visual Builder, duplicate the second row. Before we edit the new duplicated row, open the Row Settings in the second row. Under General Row Settings, check to disable the row on phone and tablet. Now the second row will be hidden on mobile devices. Next, we need to change the layout of our new third row to how we want the order of the columns to be on mobile. 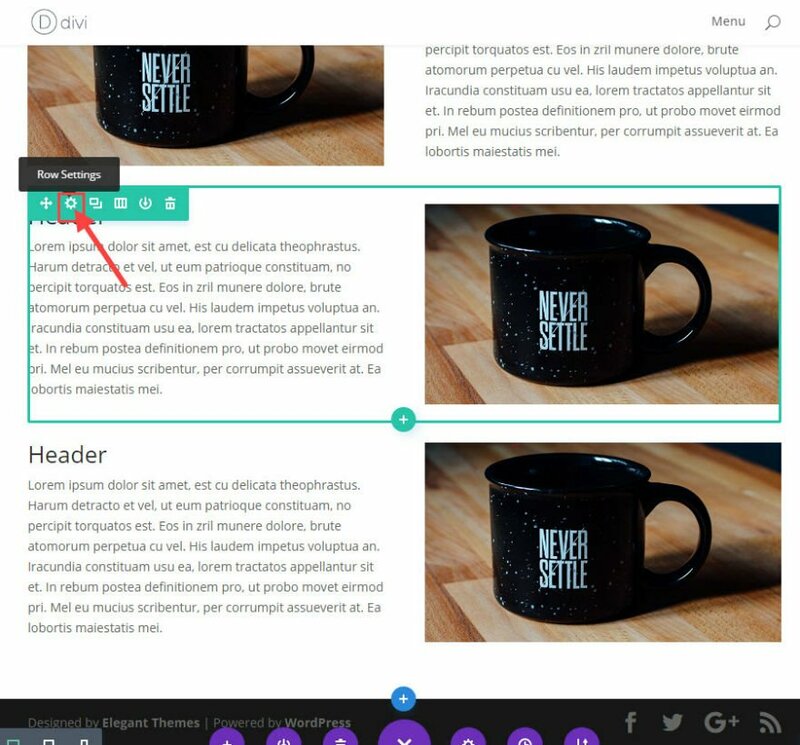 Drag the text module content over to the second column and drag the image module over to the first column. Now go into the General Row Settings for the third row and check the box to disable the row on desktop. Now check out your results. You will notice that the third column is disabled on desktop and then enabled on mobile devices. This creates a more consistent layout on mobile. 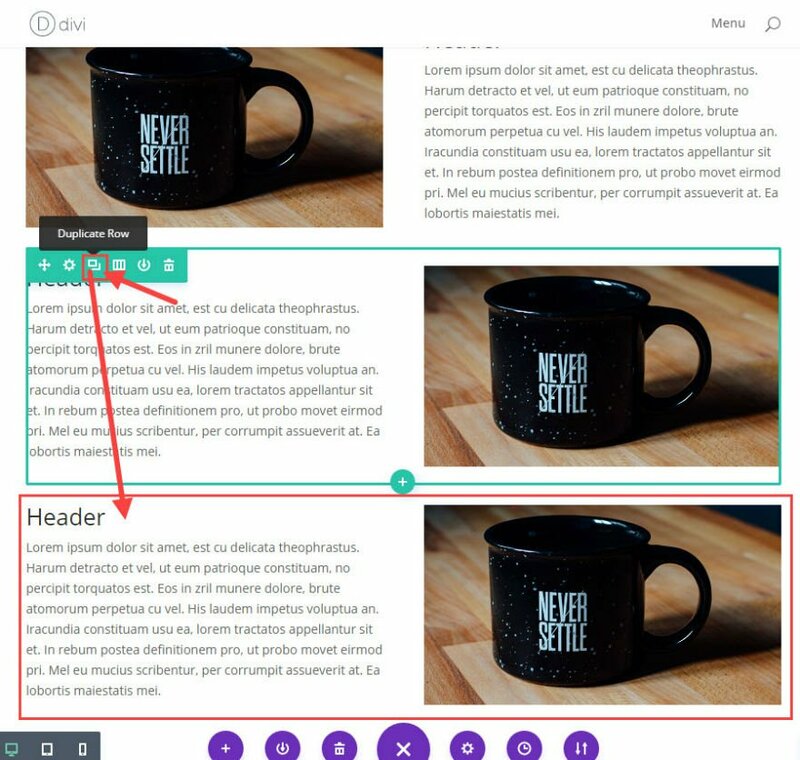 With this ability to disable and enable certain sections of content, you can change/reorder any type of layout easily. 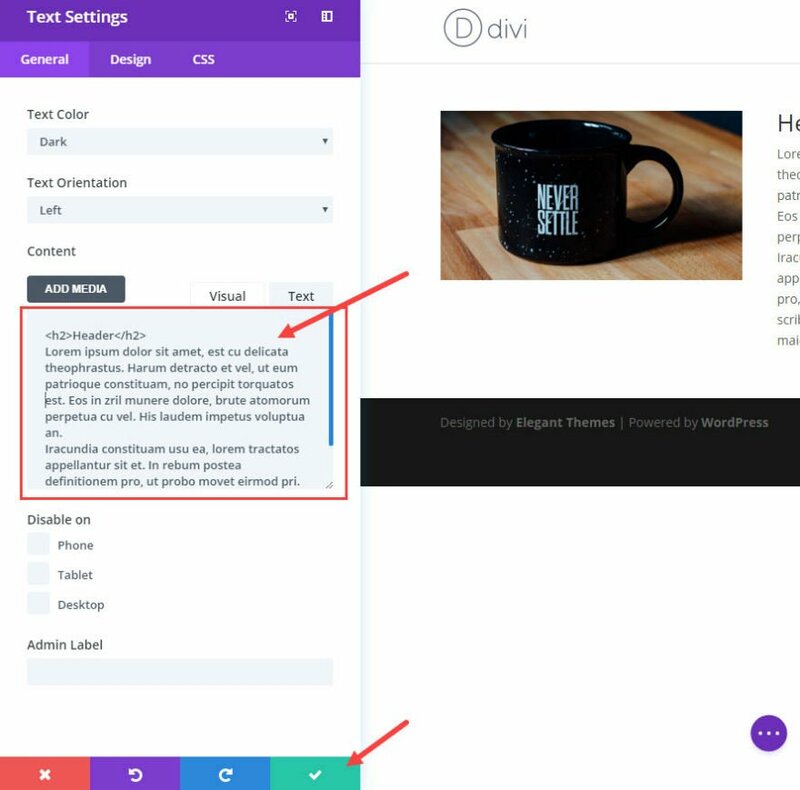 Also, when viewing your page from the Visual Builder, Divi conveniently fades the content that is hidden on the page so you can identify which content is disabled. Using the “Disabled On” feature to hide columns and rows is a safe bet. However, if you do this too much and/or have a lot of content, editing the page can get confusing. And, when making updates to content, you must update the content on all versions, not just one. If disabling and enabling content is not the right solution for you, there is another way to order your content on mobile using CSS classes. 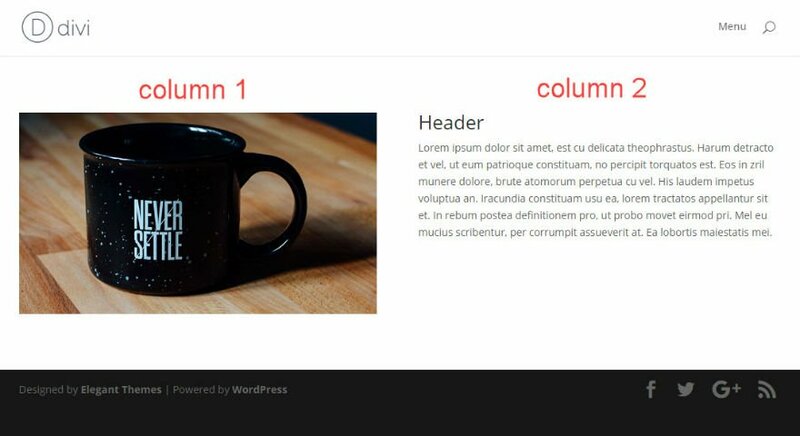 To do this we are going to use some custom CSS so that we can add a class to our columns that will order them however you want on mobile display. Looking at the CSS you just added, notice all of the CSS is contained with a media query that will only use the css for mobile devices (on screen sizes less than 980px wide). You will also notice the first class called “custom row”. This class will be added to the row you would like to change the column stacking order on mobile. The next 4 classes (“first-on-mobile”, “second-on-mobile”, “third-on-mobile”, and “fourth-on-mobile”) have an order property and a number value assigned to it. These classes will be added to the columns within your “custom” row to designate the order you want them displayed on mobile. Now that we have our CSS in place, let’s apply these classes to our page. Make sure you have your two rows created by following the directions. Also, make sure you don’t have any of the rows disabled on mobile or desktop. For this example, we are going to change the order of the columns in second row on mobile. Here is an illustration of what we want to accomplish. 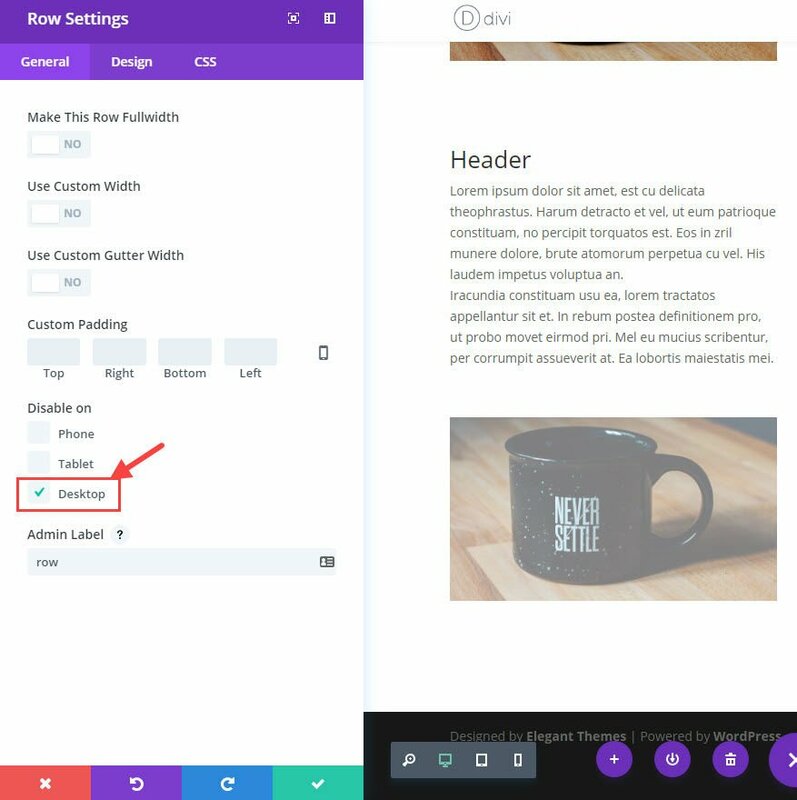 Using the Visual Builder, open the row settings for the second row. Note: It is important to add an ordering class to each column. Now Let’s check out the results. Notice on mobile how the second row columns have been changed to display the same as the first row. 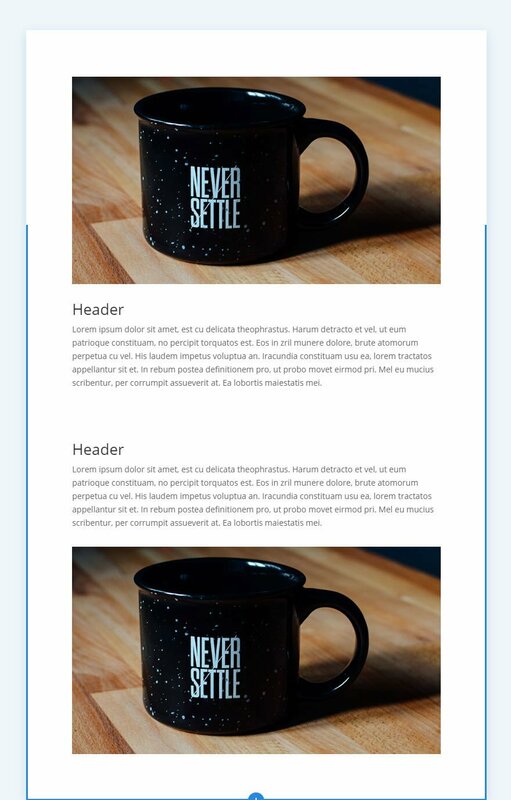 This creates a consistent flow of image → text → image → text. Just follow the same steps you did before. 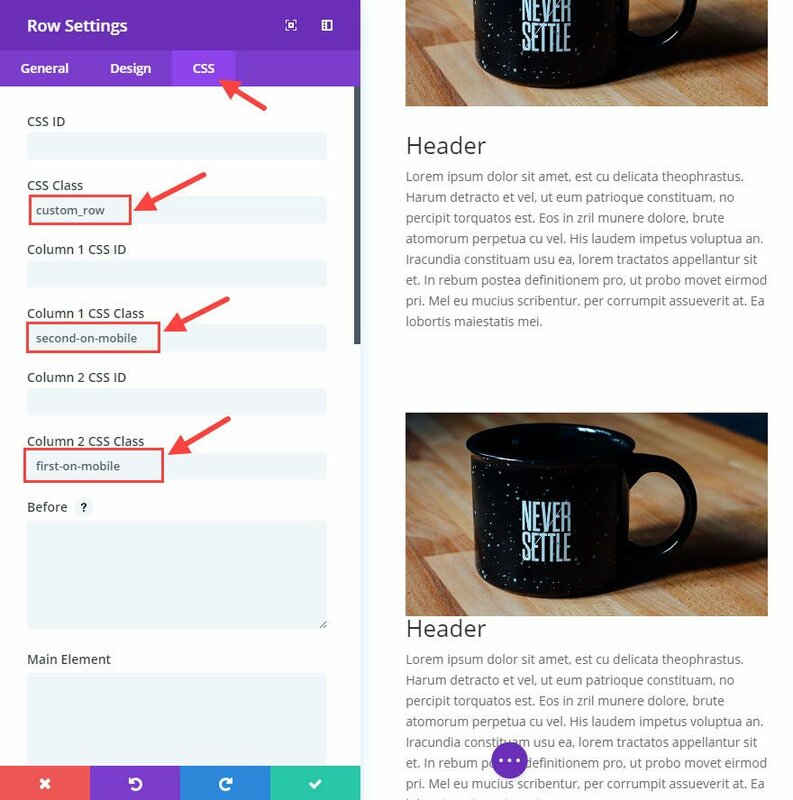 In your row settings, under the CSS tab, add a the class “custom_row” to the row and add your ordering class (“first-on-mobile”, “second-on-mobile”, “third-on-mobile”) to each of your columns. Remember to make sure you add a class to each of your columns so they all have a designated order value. 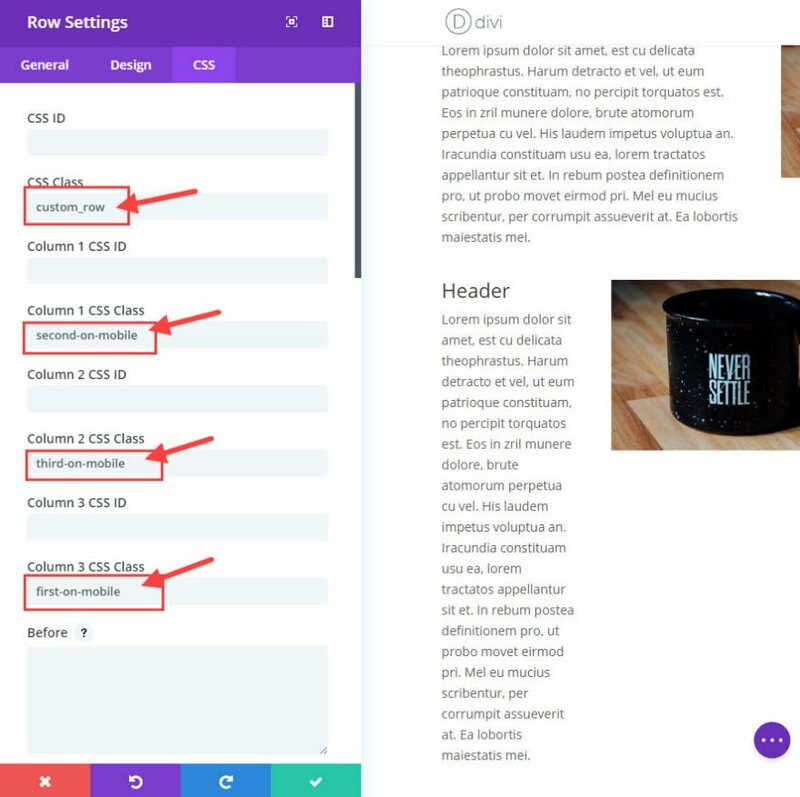 If you need to create distinct layouts for each device and/or plan on changing the content in addition to the column order on mobile, then you would need to use Divi’s “Disabled On” feature to customize your layouts. 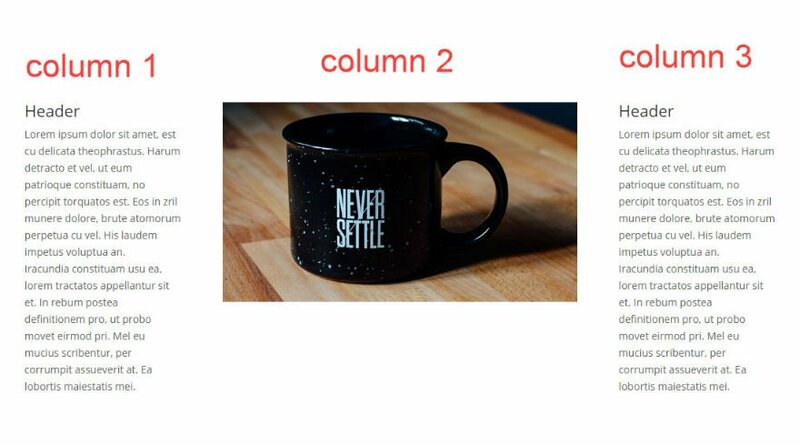 If you only need to reorder columns on mobile without changing content and you don’t want to bother with juggling multiple disabled/enabled versions of content, then you may benefit from the CSS method. There has been much debate over the years about how search engines handle content that is disabled or hidden on a page. Even though you may hide content for certain devices, the content is still crawl-able by Google. This could be considered duplicate content and might suggest that using the “Disable On” feature would negatively effect your page ranking. However, search engines like Google are pretty good at identifying if content is hidden for responsive layout reasons. In short, Google knows if you are duplicating content for different devices and will not penalize you for it. As long as you don’t hide content for malicious reasons, it is safe to use. Being able to change stacking order of columns is extremely useful and sometimes necessary. We all need the ability to create a unique design layout for desktop display without compromising the consistency of content flow on mobile. 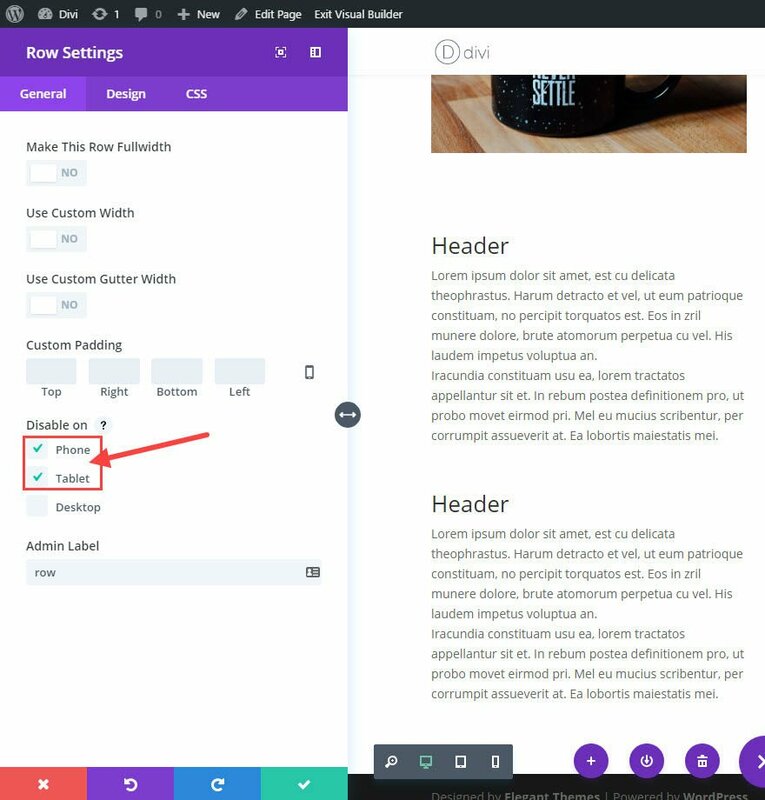 Using Divi’s “Disable On” feature, you can create completely different layouts for each device. Also, with a few lines of custom CSS, you can easily add classes to your rows and columns to order them however your want for mobile devices. I hope this post will help you gain more control over your mobile displays. Super handy, I like the flexbox ordering because it doesn’t bloat the code on the page. Thanks for sharing. Flexbox becomes more and more popular for these type of things. CSS Grid also brings super power to the web. This problem has always been a pet peeve of mine but I didn’t know a good solution until this contribution of yours. So this article and your copious explanations are really, really useful! Thanks a bunch! Really useful, sometimes it´s necessary change the order to mobile. Thanks! Great tip using CSS classes instead of duplicating rows. Less mess. Thank you Jason for this one and all the thorough guides you put together. They really come in handy. I’ve been looking for a way to do this. Thank you! I prefer the CSS version for my needs though, as the first solution means bloating the page with hidden content. EXCELLENT INFO, Exactly what I need. Thank You Jason! A very useful article, and the timing couldn’t have been better. Oh, and the code works perfectly. Thanks so much!